All games were still playing at 7.30pm and I was getting very nervous and hungry. Gawain’s opening didn’t go to plan as such and he’d been defending a worse position for the majority of the game and I feared déjàvu especially when Judit started to repeat position twice several times but Gawain held the position and is now off the board with 1 point! Thanks to the 3 for a win, 1 for a draw and 0 for a loss system. 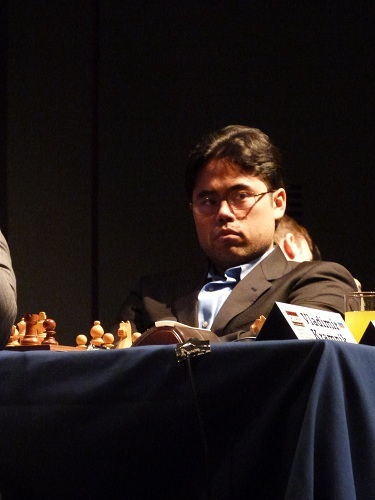 Nakamura before his loss against Kramnik. Today he plays American GM Hikaru Nakamura. I spoke to Hikaru’s mum, Carolyn who remembered them playing as young boys in the World U12 in Spain (I think). Gawain played into one of his old favorites the Dragon but struggled to equalize and Judit was better for most part of the game but Gawain defended exceptionally well to hold the draw! Anand seemed to gain an advantage in the opening but sacrificed a pawn which gave Luke lots of play but Luke got extremely short of time again and didn’t manage to find the right move. They played for 107 moves! With the other games, I got too nervous to hear the commentary so I didn’t follow the analysis. It’s kind of tough in the commentary room too as I’ve got to know the Hiarcs guy (super awesome opening book btw) and I can see the supercomputer’s analysis at a depth of 28!! Whilst watching Gawain’s game, Julian Hodgson mentioned Gawain being Welsh. Though Gawain is a British citizen, he’s most definitely English being born in Keighly, Yorkshire and even after moving abroad he loves pubs,room temperature beer,pork pies, scotch eggs and old English sitcoms (we are going to see Spamalot). He does like most British people have mix blood so on his maternal great-grandparents are Welsh and that’s about it. His name, Gawain comes from the King Arthur legend where Sir Gawain was one of the Knights of the Round Table. 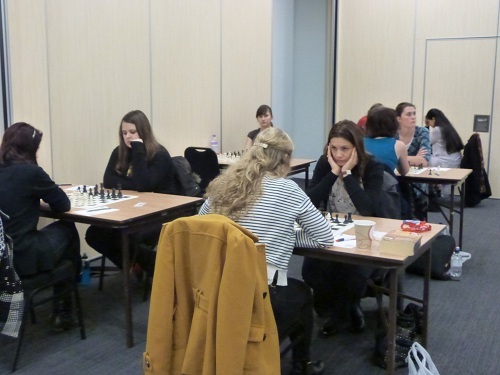 I wanted to mention some of the side events that are being played, the FIDE Rated Open and the Women’s Invitational. 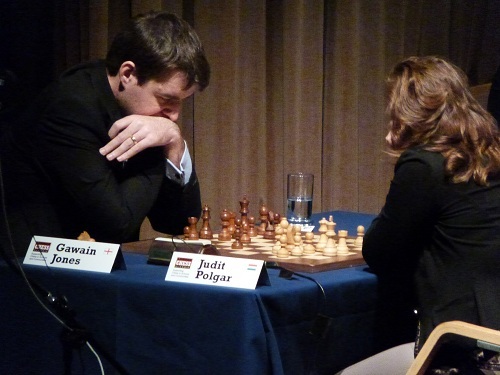 In the last few years, Gawain played in the FIDE Rated Open and won it in 2010. These are both great events to play in and I spot many players I can recognize including two of our flatmates. 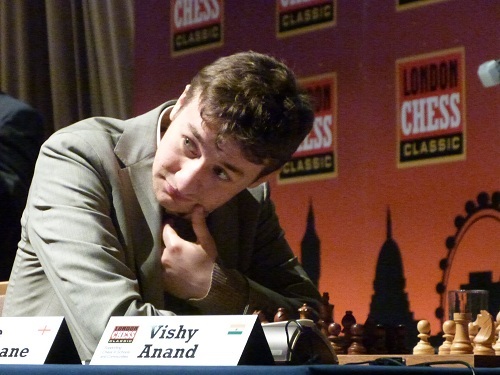 Hrant Melkumyan is the top seed in the open as well as being Lev Aronian’s second. They are on a similar schedule but on Wednesday they play whereas the Classic players have a well needed rest day. I’ve heard that there has been site problems but I’ve been told extra servers have been bought to combat the problem. If you do struggle on the home website, I think you can watch them or chessbomb (?). If I’m incorrect please tell me. 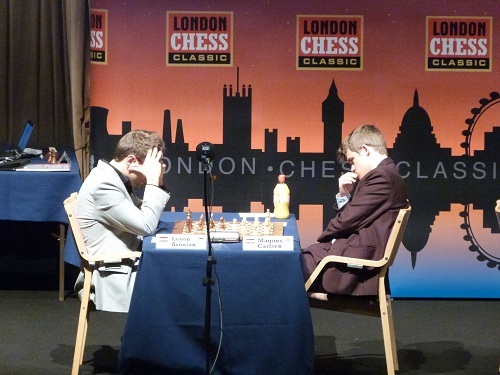 « Round 1 – Explosions and two very long endgame.